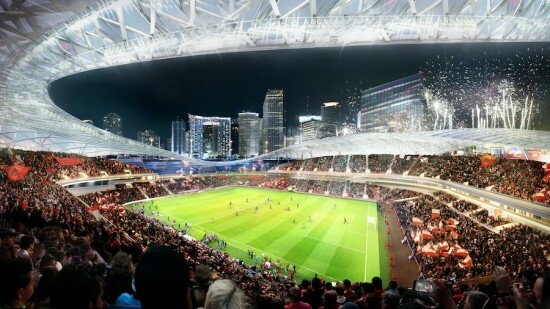 A lack of a viable stadium had been seen as a key hole in Miami’s efforts to welcome a Major League Soccer franchise. 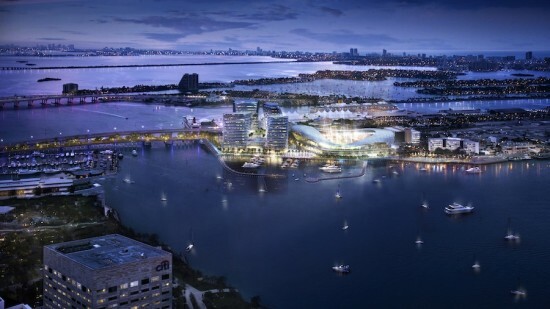 Now local firm Arquitectonica has stepped in to fill that void, collaborating with 360 Architecture to design a potential waterfront soccer venue. 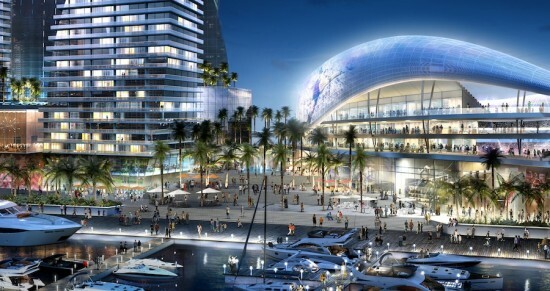 The campaign has a rather dashing face in the form of soccer-star David Beckham, who has provided vocal and financial backing for the plan and apparently played active role in the design concept and siting of the proposed stadium. Beckham asked the architects to embrace the notion of water and beach as key elements of the idea of Miami, a consideration that seems to have manifested itself in the wavy amorphous forms of the building. Arquitectonica principal Bernardo Fort-Brescia sees the stadium as a cog in the ongoing development of the Port of Miami, which was selected from a list of 30 locations under consideration. 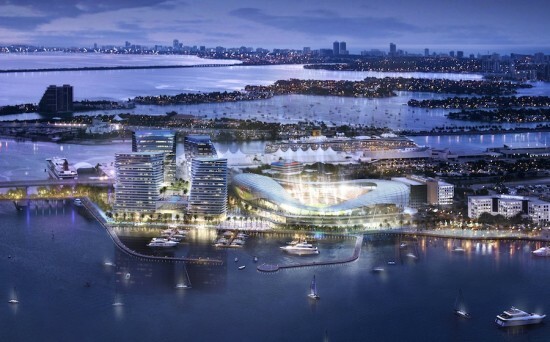 Hotels and office buildings are other new additions seen flanking the stadium in preliminary renderings. Realization of the team is still a ways away, but co-owner Marcelo Claure set an optimistic 2017 date for an MLS debut. Despite the renderings, a waterfront address is no guarantee as negotiations regarding stadium locale are ongoing with Miami-Dade County and Mayor Carlos A. Gimenez. The city’s entry will be preceded by Northern neighbors Orlando, who plan to have the woefully-named Orlando City SC ready to join the league by 2015. New York is also set to welcome a second team next year, though their search for a permanent home has been beset by controversy. Delays may force the team to debut in a temporary venue while more lasting arrangements are made.